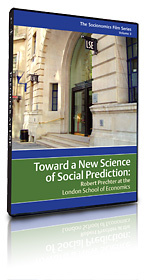 In this fascinating, two-hour lecture delivered to a standing-room-only audience at the London School of Economics in 2004, Robert R. Prechter Jr. presents compelling evidence in support of socionomic theory. Now you, too, can experience this extraordinary event — in brilliant DVD format. Prechter presents his arguments with the aid of 75 charts and other illustrations to explain the origin of trends in the stock market, economic production, presidential elections, domestic and international conflicts, demographics, innovations, popular culture and more. This groundbreaking DVD is available now. Note: Orders are fulfilled by Elliott Wave International on behalf of the Socionomics Institute. "Robert Prechter is one of the leading financial thinkers of all time. His speech demonstrates numerous unknown, important, and difficult to believe facts about the social world. The next time you read that the stock market moved because of an event like oil prices, inflation, interest rates or earnings, you'll smile and know that it was social mood that led to the stock move, the event and the headline." "Bob's presentation is incredibly interesting. He offers crystal-clear ideas and convincing evidence for a new understanding of economics, finance and society. It is a must-see for every serious economist, sociologist and statesman who wants to understand what moves their world. It will open your eyes, and afterwards the world will never look the same."